Photoshop Showcase Services, easily accessible within Photoshop Elements, allows you to share your photos without paying an online service fee or paying for a Web address. Many creation and sharing options, other than those creations you assemble for printing to a desktop printer, require you to make purchases. Open the Share panel and click Online Album. 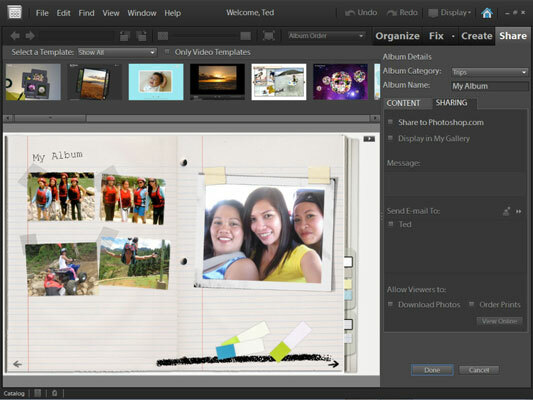 Elements provides you with a number of sharing options for distributing photo albums. Sharing photo albums online provides several different choices. Share Existing Album: If you have an album assembled, the album(s) appears in the Albums list. Create New Album: If you don’t have an album in the list, or you want to create a new album, select this option. Photoshop.com: This free online hosting service lets you share photos and albums and invite family and friends to see your images free of charge. Export to CD/DVD (Windows only): This option enables you to export albums to CDs and DVDs. Export to Hard Disk: Use this option to export an album to your hard drive. The export is an HTML file that you can view in a Web browser. Click the Photoshop Showcase radio button on the Share panel. The panel changes to display two tabs. One tab is denoted as Content and the other tab is denoted as Sharing. By default, the Content panel is in view and displays all selected photos in the Organizer as thumbnail images. Select the photos you want to share and then click the Sharing tab. The panel changes with a preview display of the showcase in the image window. Click the Sharing tab and a preview of the showcase appears in the image window. Make sure Photoshop Showcase is selected and click Done on the Share panel. The Adobe Photoshop Services Wizard opens. If you do not have an account, you can sign up on the opening wizard page. If you do have an account, supply your logon information and click Next. The Welcome screen informs you of the amount of space you have remaining on your account and the current usage. If it’s your first effort in using the service, you’ll find 0 percent used. This is the first screen you see after logging on to the Adobe Photoshop Services. Click Next, and you can add recipients, set viewing options, and upload your photos. You can restrict viewing to invited participants only or make your showcase public where anyone can view the photos. When you’re finished uploading, click Done. Your default Web browser loads the Web page where your album resides on Photoshop Services. The URL listed in the Location bar in your Web browser can be copied and pasted into an e-mail message. If you elect to display your showcase to all viewers, anyone visiting the URL can see your photos.